Also known as Guanyin Bodhisattva the Goddess of Mercy. One of the deities most frequently seen on altars in China’s temples is Quan Yin (also spelled Kwan Yin, Kuanyin; in pinyin, Quan Yin). In Sanskrit, her name is Padma-pâni, or “Born of the Lotus.” Quan Yin, alone among Buddhist gods, is loved rather than feared and is the model of Chinese beauty. 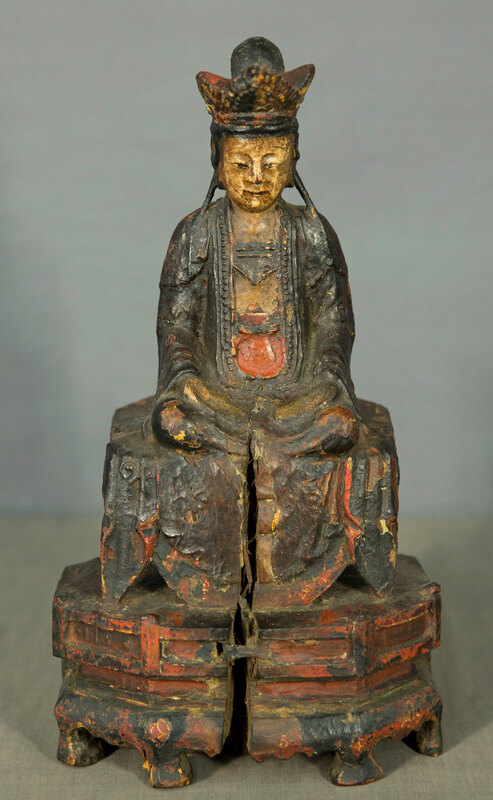 One of the several stories surrounding Quan Yin is that she was a Buddhist who through great love and sacrifice during life, had earned the right to enter Nirvana after death. However, like Avlokiteshvara, while standing before the gates of Paradise she heard a cry of anguish from the earth below. Turning back to earth, she renounced her reward of bliss eternal but in its place found immortality in the hearts of the suffering. In China she has many names and is also known as “great mercy, great pity; salvation from misery, salvation from woe; self-existent; thousand arms and thousand eyes,” etc. In addition she is often referred to as the Goddess of the Southern Sea — or Indian Archipelago — and has been compared to the Virgin Mary.